In a sign that Japan's crackdown on crypto firms might be coming to an end, the Financial Services Agency announced penalties against three unlicensed exchanges that will force two of them to suspend operations. According to Bloomberg, the FSA issued a "business improvement order" against FSHO, Eternal Link and LastRoots. FSHO and Eternal Link were also ordered to suspend operations, with FSHO ordered to shut down between April 8 and June 7, and Eternal Link from April 6 to June 7. The exchanges were ordered to make improvements in bookkeeping, systems risk management and anti-money laundering and terrorism controls. Inspections into the country's 16 unlicensed crypto exchanges are ongoing. Japan launched its probe after CoinCheck, one of the country's largest unlicensed crypto exchanges, was attacked by hackers, who stole more than $500 million worth of NEM tokens in what has been described as the largest crypto heist of all time. The FSA had earlier ordered CoinCheck to firm up its consumer protection and money laundering controls. On Thursday, Japanese online brokerage firm Monex Group announced it would buy Coincheck Inc. for 3.6 billion yen ($33.6 million) after assuring the FSA that it would implement the improvements mandated by the agency as it plans for an eventual IPO of CoinCheck - what could be the first IPO of a crypto exchange, per Reuters. 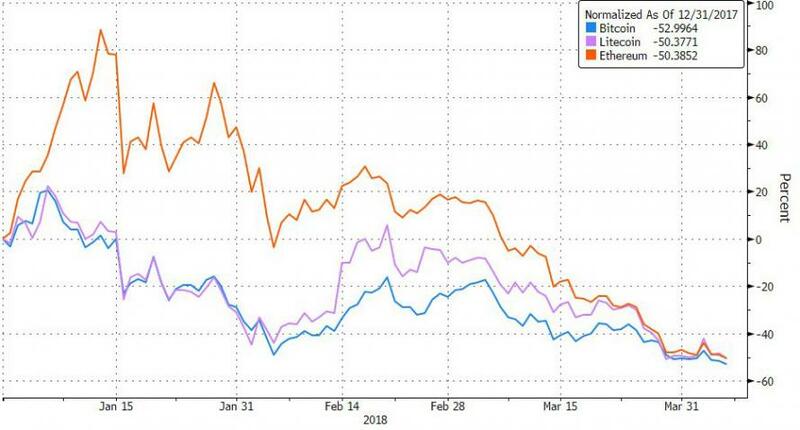 Cryptocurrency prices have continued to slide in April after notching their worst quarterly performance ever during Q1.